Whenever there’s a big dinner (such as Thanksgiving, Christmas, Easter, the Fourth, etc), there are usually leftovers. The same is often true when we go to a restaurant and bring home a doggy bag. When that happens, it’s usually treat time for our dogs. 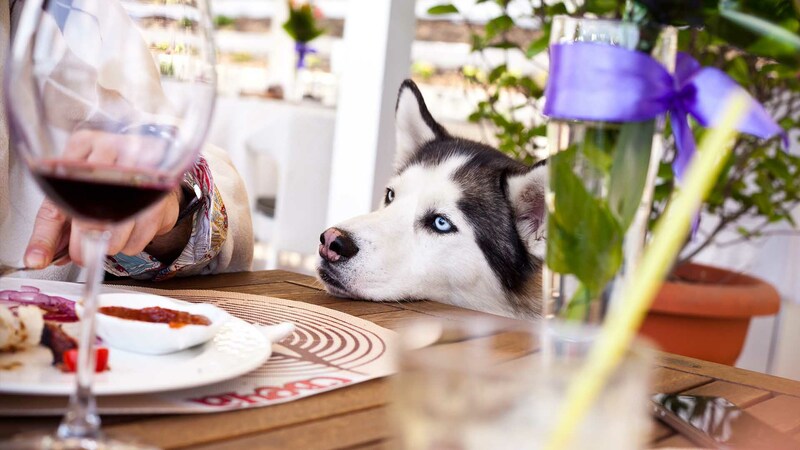 We all love our dogs and what better way to show our love than with delicious food. 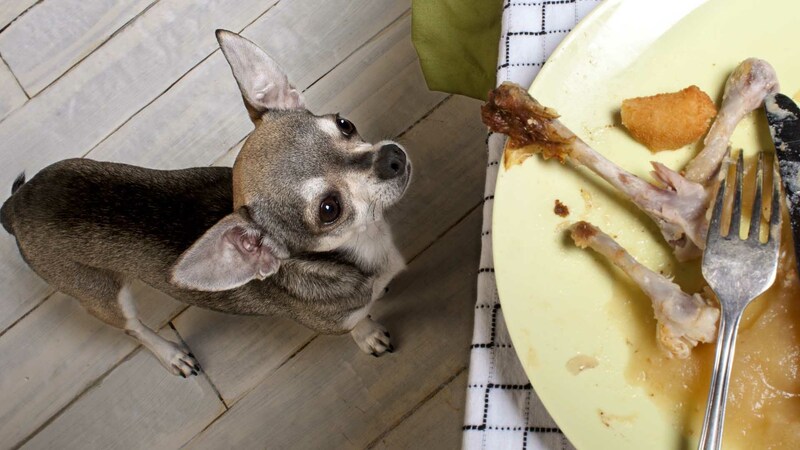 So we often spoil our beloved canines with leftovers. Sometimes, we even cook extra food to make sure there will be leftovers to give them. However, is this a good thing to do? A special treat now and then is perfectly fine, but in recent years people have been giving their dogs more and more human food. It’s time we start rethinking what we feed our dogs, and if table scraps really are the way to go. Maybe the only ones to enjoy the contents of the doggy bag should be us. There are numerous food items that are toxic to dogs but not to us. Ingredients such as onions, garlic, grapes, and chocolate, can cause serious illness if ingested. Those same ingredients are perfectly fine for us, and we use them for cooking all the time. So even if we give our dogs chicken or beef, for example, but they have been cooked with garlic and onions, we could be putting our dogs at risk. Nearly all people food have some sort of seasoning or flavoring that can cause ill effects. 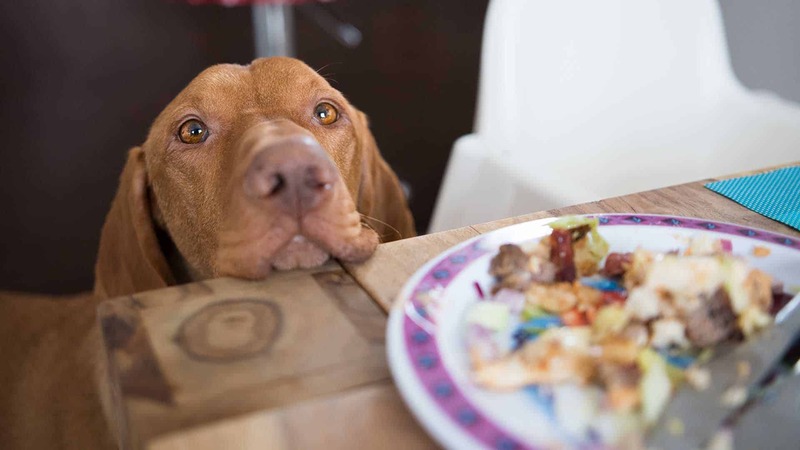 So, unless we cook our foods very consciously so that they are dog friendly, chances are any leftovers we give them will have something in it that’s not good for them. 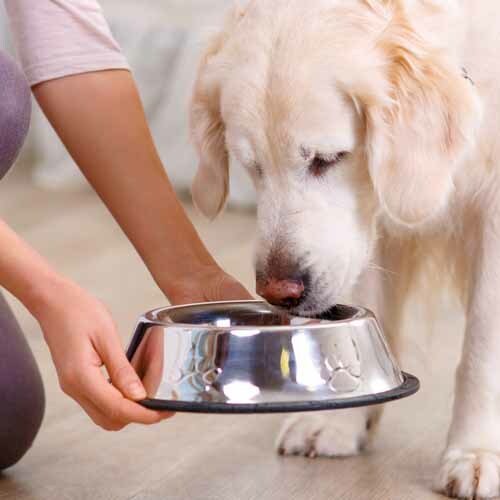 Again, a small amount on a rare occasion should be all right, but greater quantities or repeated treats can build up and affect your dog. Therefore, it’s best to resist the temptation to give our furry friends people food. Even if they beg and give you the sad, puppy eyes. Salty, spicy, oily, oh my! Have you ever noticed your dog heading straight for the water bowl after scarfing down some beef brisket or BBQ chicken? They drink and drink and drink. That’s because dogs aren’t used to the amount of salt, spices, and oils in most human food. Even if they are used to it, their bodies still can’t handle it very well. We liberally season our foods (though we probably shouldn’t either), and we use oil whenever we cook. The difference is, we can digest salt and oil, whereas dogs have a tougher time. We can eat spicy kung pow chicken, or salty beef jerky, or greasy deep fried fish. It may not be good for us, but we can do it. For dogs, however, it’s a different story. It’s harder for dogs to process out these toxins, so it’s best if we keep our dogs away from them. 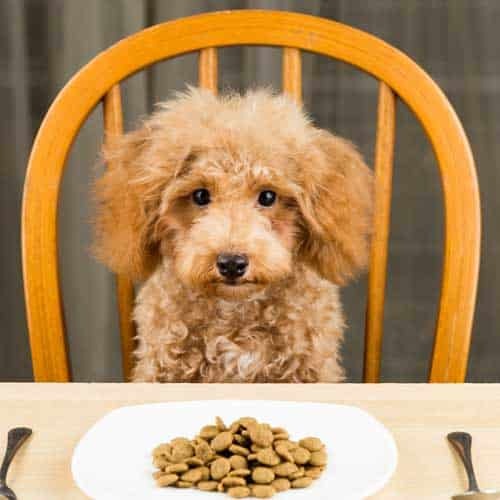 Of course, even if your dogs don’t suffer any health effects, there’s always the other, uh, ahem, consequences of eating foods that they shouldn’t be eating. The results can be very unpleasant, for all concerned. Certain foods and ingredients can cause vomiting and diarrhea, sometimes severe. If it’s an emergency, take your dog to the vet immediately. 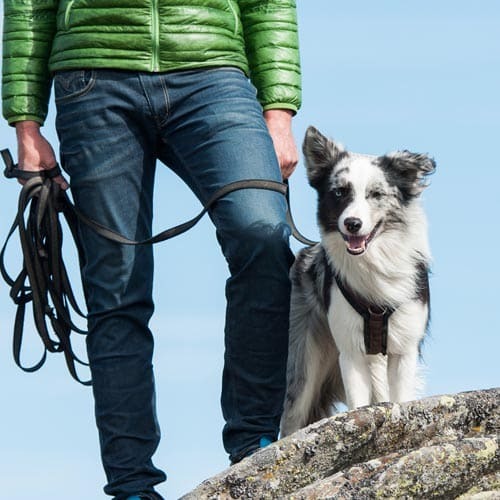 However, even if it’s not at that level of severity, it’s still discomforting for your pup. It’s like the equivalent of us eating, for example, expired shellfish – not a pleasant experience. If this happens, make sure to keep your dog’s diet strict and clean for several days. A trip to vet might not be a bad idea either, just to make sure. Try to remember what your dog ate to cause this incident and take care to not give that same food item ever again. Digestive problems are something we all can do without. The body is trying to tell us something, so we should always be tuned in to what it’s saying. In the end, dog food is for dogs and people food is for people. 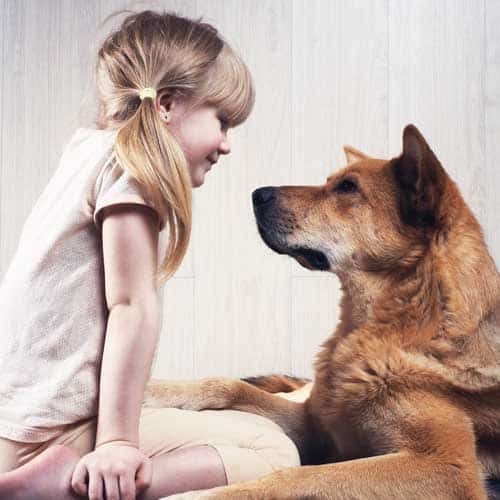 Maybe tens of thousands of years ago when we first intermingled with dogs, the foods we ate might have been compatible. However, today, our diets are very different. Cooked food is still a relatively new thing, even for us. In fact, there are many people who are advocates for a raw food diet. However, humans have been cooking for long enough that we have become able to handle it. Our dogs are a different matter. Even with sharing their world with us, they still have more of a “natural” diet. 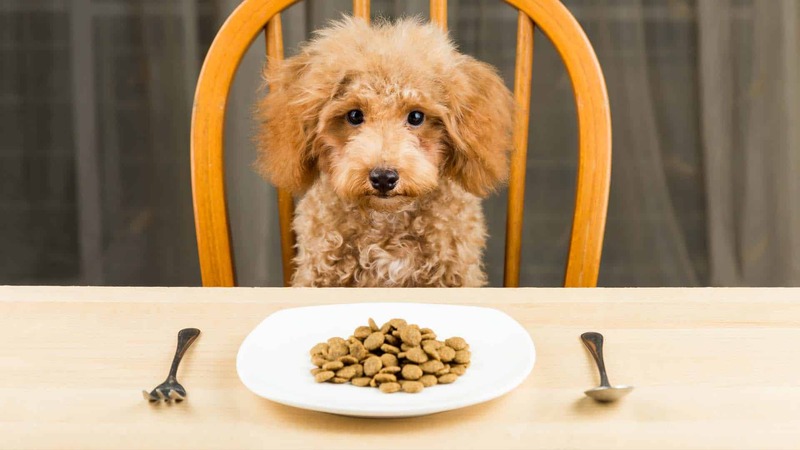 There are still many foods that are toxic to dogs, which tell us that dogs have not fully developed their metabolism to handle many of the things we humans can eat. It’s essential that we keep this in mind the next time we give our furry friends a treat from our table. We might show more love by having restraint.